On our website we have compiled a list of ideas for raising funds for your youth garden program through garden-related fundraisers ranging from simple things like selling handmade crafts to more complex projects like starting your own farmers’ market. 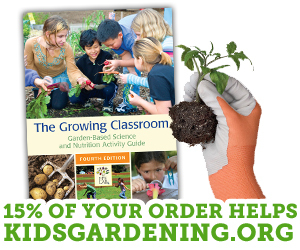 Wearing my garden educator hat, I love exploring all the possibilities of turning an essential activity like fundraising into a fun, hands-on, real-life learning experience. But this week, I put on my busy PTO mom hat and we held my favorite fundraiser of the year – we call it 100 Coins for 100 Days. I am not sure how widespread this tradition is, but at our elementary school, the teachers and students celebrate the 100th day of school usually with special projects and by dressing up like they are 100 years old. Our PTO decided to build on that event with a very simple fundraiser. On the 100th day of school we put buckets in each classroom and ask students to bring in 100 coins (in any combination of pennies, nickels, dimes and quarters) and the class for each grade level who has the highest percentage of students participate (not based on actually money brought in by the class– the teachers just record how many students dropped money in the bucket because we want to make it as easy as possible) gets as small prize (a prize for all students in the class regardless of whether or not they participated). Promotion of the event includes a ½ sheet flyer and electronic communications. The buckets were donated and are reused every year. The prizes are also either donated or leftover from other events (this year for example they are 3-D bookmarks donated by a parent). Our very generous bank allows us to use their coin counting machine without a fee if we load it up ourselves (I learned to bring gloves – the coins are icky). All together, there are no direct expenses and it takes about 4-5 hours of volunteer time from start to finish. It truly is the easiest fundraiser ever! What kind of results do we get? This year we raised $1141.76. This one event pays for our entire garden budget ($800) with some to spare. I realize this is not a huge amount of money necessarily, but for our Title I school that has a lot of challenges with parent engagement, this fundraiser is definitely a win and the funds raised to effort expended ratio is excellent. From my perspective, connecting the coin drive to an existing tradition and also making it a one-day, annual event are important factors for getting everyone excited about it. I am not sure it would be as successful if we tried to do it on a more regular basis. I know this is a bit of a different ‘green’ suggestion than I normally share, but I can tell you that as we kick off our garden season this Friday by planting tomato seeds under grow lights, we will definitely be thankful for our successful 100 Days fundraiser that has ensured we will have plenty of funds for both this spring and next fall’s garden.